Divine health and prosperity are better than divine healing and provision. If you live in divine health and prosperity, you won't need a miracle to get healed or to pay your bills. If you can't see the difference between the two, that may be one reason you only visit God's best instead of truly living in it. Most Christians live in a place where it's just a matter of time before there's a crisis in their lives and they need a miracle. You might think it would be wonderful to go from miracle to miracle, but that means you'd also be going from crisis to crisis! Miracles are great when you need one, but you weren't meant to continually get by on them. God wants to change where you live. 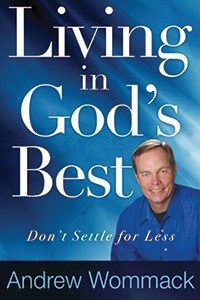 Let Andrew show you how to live in God's best today! See website(s) below for product pricing. God's Kind of Love: The Cure for What Ails Ya! Sign up today to keep up with AWM's latest news and upcoming events! © 2019 Andrew Wommack Ministries, Inc. All rights reserved.